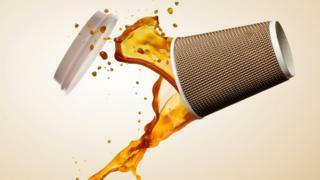 A coffee-delivering drone that can detect when people are tired and bring them a drink has been patented by technology company IBM. The patent describes a drone that can identify the "cognitive state" of office workers and lower cups of coffee on an "unspooling string". Technology companies frequently patent products even if they have no intention to sell them in the near future. IBM has not revealed whether it plans to produce the coffee drone. The patent, filed in the United States, where the process can cost thousands of dollars, describes several variations of a drink delivery drone. In one example, coffee is dispensed from the drone directly into a worker's mug. Another option describes hot drinks delivered in a sealed bag, to prevent any scalding drips. IBM suggests the drone could be equipped with technology to detect blood pressure, pupil dilation and facial expressions and judge whether people are drowsy. Alternatively, people in an office could be able to summon a cup of coffee with a hand gesture. IBM was once a leading manufacturer of computer mainframes and desktop PCs. However, it has more recently turned its attention to software and artificial intelligence, developing products such as an "arguing machine".